I love everything about staying in a hotel. From curling up in the huge, meringue-nest style bed with a cuppa in hand watching real crime dramas on an obscure TV channel to the all-you-can-eat buffet breakfasts that have you walking around the whole day looking 5 months pregnant, I am a massive fan. I love how you can make a phone call at any given time and then BAM a burger is hand-delivered to your room. Oh, and I love the fancy bathrooms - I swan around in them like some fifties film star with a towel wrap on my head feeling so suave. But the best thing about a hotel is that every night feels like fresh sheet night. So, when we were planning our trip to Edinburgh, we knew we wanted to go somewhere a little bit luxurious. I'm not talking crazy, Ritz-level luxurious but somewhere that would feel a little bit special but still be within our price range. That is when we came across Hampton by Hilton in Edinburgh's West End. It had everything we needed - fairly close to the centre, free wifi, buffet breakfast, and nice rooms (and, yes, it made me feel suave). It was £79 for a night (much cheaper than the other hotels whose prices made my jaw drop to the 7th circle of hell) and, I must say, it was well worth it. On the first night, all that was left to book was a twin room (we left it pretty late tbf) so we went with that. In all honesty, our expectations weren't that high. I was imaging two tiny, single beds squeezed into a room that my husband would suggest we push together which would ultimately result in one of us falling into the gaping hole that always appears between the two mattresses. So, you can imagine we were pretty shocked to find a sizeable room with two double beds. There was so much space for Ava's travel cot and so much space for me to starfish the night away. Win. We had originally only planned to stay for one night but soon extended our stay as Edinburgh was awesome and we weren't ready to wave our hotel room goodbye. The second night, we got a double room. It was pretty similar to the twin room but had a little more room (and, obvs, just one huge bed). It had a chair in the corner and a foot rest where you could recline back and watch people walk by down on the street below (or read a book, if you're not as nosey as me). We then whizzed off for a few days in the Lake District before returning for a final night in Edinburgh. This time, we booked a double room but they kindly upgraded us to a family room. And it was awesome. The room was huge and had a whole sofa in there - which we made full use of when we rounded our trip off in a fashion so true to us - getting a Hawaiian pizza with chips and a battered black pudding and eating it on our hotel room sofa in our PJs. Even Ava was excited to be crawling around - a collection of chips and bits of pineapple in hand. As the old saying goes, a hotel is only as good as its breakfast. And Hampton by Hilton didn't disappoint. It was so good that I didn't even have time to snap any pics - I was already one plate down before I even thought of getting my camera out. Even then, I lumped for my phone instead. Who has time to take pics when there are croissants to shove in your mouth? This place had all the usual components of a hotel breakfast - cooked breakfast (with the addition of potato croquettes and, ofc, haggis), pastries, bread, fruit, and yoghurt. But my favourite thing was the make-your-own waffles section. You basically poured the batter out of a machine and put as much as you wanted into the waffle maker. Then, after a few minutes, you could add any sauce or fruit or anything. I opted for red berries and a bit of syrup and it was lush. I liked that you could choose how big your waffle was gonna be too because I don't have to most huge appetite when it comes to meals but I don't like seeing food go to waste. It has to be said, Isaac and I aren't the best planners. We're more dive in and hope for the best kinda people. So, we had no idea where this hotel was actually located when we booked it - but, once again, we were pleasantly surprised. It was a ten minute walk to Grassmarket (Edinburgh Old Town where you will find Diagon Alley-esque streets and a direct path to the castle - a very vertical path, may I add) and about twenty minute walk to the highstreet. And five minutes from a good chippy (I see you, chip fans). 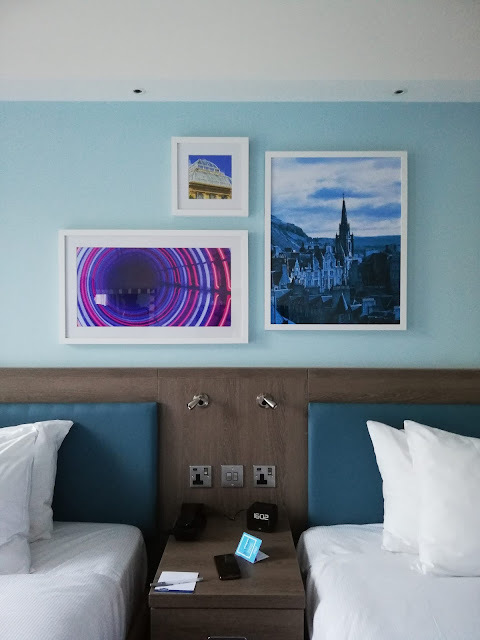 Overall, our stay at Hampton by Hilton in Edinburgh's West End was pretty stellar. It is rare that a chain hotel has that extra little something that makes it memorable but everything from the helpfulness of the staff to the lush waffles really made our stay feel special. What's your favourite thing about staying in a hotel? If you liked this post, I would greatly appreciate it if you headed on over to The UK Blog Awards and voted for me in the lifestyle category! Click here to cast your vote. Curling up in a corner with a hot cup is indeed, one of the best thing in life! Love the beret, and I love hair shade, so pretty! Wow a waffle maker completely sells this to me! Haha. I love a big bath when I go to hotels as we don't have a good one at home. Love buying a bath bomb specially. Awww I love the pic with the baby staring out the window. The cutesttt thing! That hotel looks so nice! And fresh sheet nights are the best! Yes! With the added benefit of not having to make the bed yourself! Looks like you had an amazing stay babe! It was lovely, can't recommend this place enough!